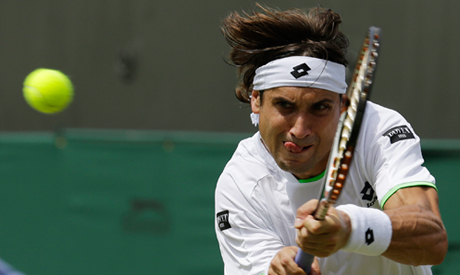 David Ferrer wore down Croatia's Ivan Dodig with his high-energy scrambling to move into the Wimbledon quarter-finals with a 6-7 (3) 7-6 (6) 6-1 6-1 win on Monday. The Spanish fourth seed arrived 10 minutes late on Court Two and was slow to impose himself on the match, losing the first set in a tiebreak before winning the second the same way. Dodig, ranked 49th in the world, could not maintain his consistency as the match wore on and his serve, which had been such a weapon in the early stages, faltered to allow Ferrer to turn the screw. After failing to win a point on the Dodig serve for four successive games in the second set, Ferrer broke three times in the third and twice in the fourth to wrap it up. Ferrer, who has now reached seven successive grand slam quarter-finals, will next face eighth seed Juan Martin Del Potro or Italian Andreas Seppi.